Sitting right on the stateline is Heavenly Valley mountain resort a haven in winter for skiers and for bikers and golfers in summer. 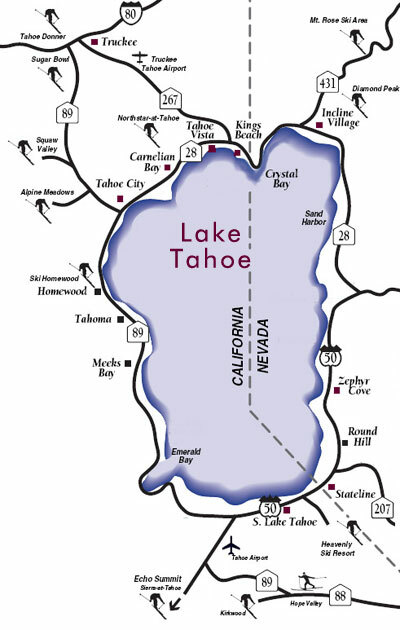 South Lake Tahoe, the city is actually in California and the larger hotels with casinos, nightlife and action are in the city of Stateline Nevada. Remember it is divided right down the middle! There is a boardwalk that spans through both South Lake Tahoe and Stateline, and you can easily walk from one to the other. We have the hotels listed by star rating so you can pick and choose the ones that are most comfortable and make your reservations online. If something more quiet, or lakefront, or with a mountain view is more your style, or you're two families traveling together, you may want to consider a South Lake Tahoe home rental which are very popular. You'll find beautiful vacation rentals with full kitchens, private jacuzzis, decks with views or lakefront and other individualized amenities from City Concierge at Lake Tahoe resort reservations. City Concierge, Lake Tahoe is the source for rental reservations, hotels and guest services. We provide lodging reservations for hundreds of homes and condos from typical cabins in the forest to 5 star homes on the lake for families, groups and weddings.